A one day menu for those days when you want to eat right but want to do it fast! Top toasted whole wheat waffles with low-fat vanilla yogurt, fresh berries and a light drizzle of maple syrup. Who says you can’t make something that looks gourmet in 5 minutes. Toast two pieces of good quality bread and lightly rub the inside of each with a peeled garlic clove (don’t go overboard or that garlic will hang around with you for the rest of the day). Spread light mayonnaise on the inside of one toasted slice. Slice a medium ripe tomato. Place tomato slices on top of the other piece of toasted bread and season with salt and freshly ground black pepper. 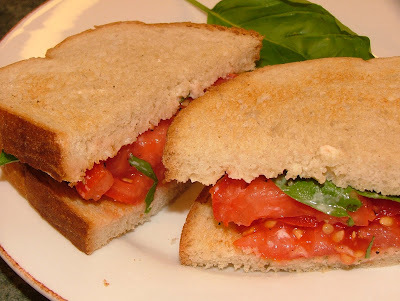 Top tomatoes with a couple basil leaves and place the other toasted slice of bread on top. It’s off the hook! There are faster dishes you could make but I challenge you to find another dish that gives you as much flavor bang for the little time required to prepare this. Pair the barbecue chicken thighs with steamed broccoli or green beans to ensure you get some good wholesome veggies in you!